It really doesn't matter what auto manufacturers do, they can't keep the wraps on a good car for long. 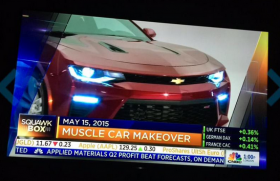 Case in point: the 2016 Chevy Camaro. It wasn't supposed to be revealed until Saturday at Detroit's Belle Isle, but CNBC aired its special on the new car earlier today. A few eagle-eyed enthusiasts took the opportunity and snapped a photo of their TV screens, with full front and rear views. Matthew the Car Guy and Italopaula were among those with shots, along with Jalopnik. Specs haven't been released yet, but GM has said the car will weigh 200 pounds less than the existing Camaro. The 2016 Chevrolet Camaro features an aluminum beam to support the instrument panel, which is 9.7 lbs. (4.4 kg) lighter than the previous steel beam. The new vehicle architecture -- the so-called GM Alpha platform shared with the rear-wheel drive Cadillac ATS and CTS -- is responsible for most of the weight loss, but dozens of smaller changes contributed. The front and rear suspensions assemblies are also aluminum, while some links feature a new design with a composite material that’s even lighter. The suspension is 21 percent lighter compared to the current steel setups. Those weights, in case you were interested, now line up almost exactly with the weight of the Ford Mustang V-6 and V-8. And with the Ford ponycar now including an independent rear suspension, these two could have the closest battles yet for track dominance.